Posted on August 25, 2017 . Maize is a leading food crop in Rwanda, representing 60 per cent of the cereals produced in the country. Its production has risen steadily from 120,000 tonnes of grain produced in 2006 to over 500,000 tonnes in 2011 according to Rwanda’s National Institute of Statistics. However, maize is susceptible to accumulation of aflatoxins, toxic chemicals produced by a fungus. Hazardous to humans when eaten at high levels, these toxins have been associated with cancers, suppressed immune systems, reduced nutrient absorption and the stunting of children. 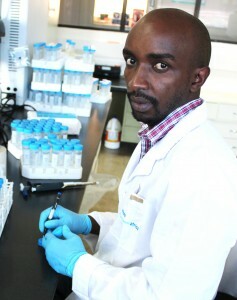 In 2014, I received an ABCF fellowship from the BecA-ILRI Hub to conduct research that would help fi ll gaps relating to aflatoxin detection in maize in Rwanda. During the first East African Conference on Food Science and Technology, in March 2016, and at the FARA 7th Africa Agriculture Science Week (AASW7) and General Assembly held in June 2016, in Kigali, Rwanda, I presented my findings to national policy stakeholders, including the Rwanda National Agricultural Export Development Board, the Ministry of Agriculture and Animal Resources, Rwanda Agriculture Board (RAB) and Rwanda Standards Board (RSB), as well as to international, regional and national researchers. My research will greatly contribute to strategies being put in place to ensure safer maize in the value chain in Rwanda. Further support is being provided by the BecA-ILRI Hub, which has donated aflatoxin testing kits to progress research in this area by my home institution. The advanced skills in aflatoxin research that I gained through the ABCF fellowship have enabled me to secure a PhD scholarship at Iowa State University under the Borlaug Higher Education for Agricultural Research and Development (BHEARD) program. I have also secured a one-year grant to facilitate the development of management strategies for minimizing afatoxin levels in animal feed. The grant is supported by Feed the Future Innovation Lab for Livestock Systems-University of Florida and is a collaborative effort between Iowa State University, the University of Rwanda and the BecA-ILRI Hub.